Do you have a bread machine, but no manual? 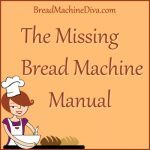 Here’s a list of links to online bread machine manuals. 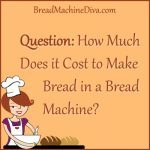 How Much Does it Cost to Make Bread in a Bread Machine? 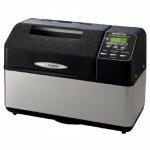 Have you ever wondered how much it costs to make a loaf of bread in your bread machine? I know I have. So I decided to do an analysis. 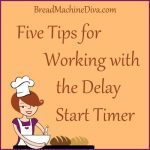 No matter what sort of bread machine you have here are some tips for using the time delay function. I’ve also got some recipes for you to use with this feature. 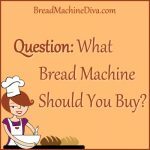 Do you want to buy a bread machine, but aren’t sure which one to order? I had the same problem. 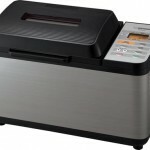 See how I chose between the different types of Zojirushi bread machines. NEVER put cold water in the bread pan while it is still hot after baking. This will warp the base of the pan and cause the beaters to scrape the non-stick coating off in a circular pattern. ALWAYS let it stand to cool before washing it out.